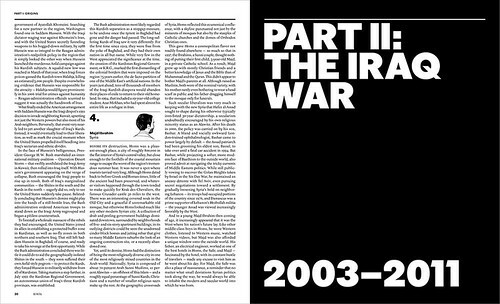 In America, the New York Times Magazine has produced an issue about ‘the castrophe that has fractured the Arab world’ over the past thirteen years: a single 40,000 word piece of journalism by Scott Anderson with twenty black-and-white photographs by Magnum photographer Paolo Pellegrin. The design, by Matt Willey, is book-like with austere monochrome typography and bold title pages that fit the mood of the story. Design Director: Gail Bichler. Editor: Jake Silverstein. The issue runs with no advertising. 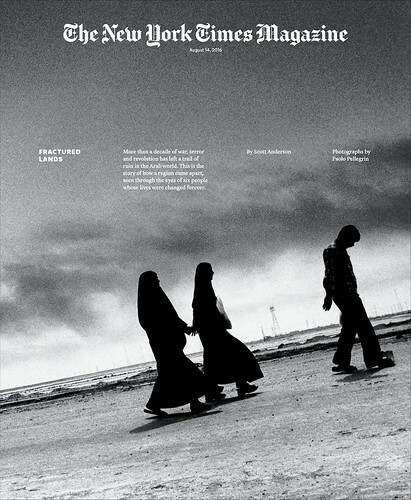 Cover of The New York Times Magazine, ‘Fractured Lands’, 14 August 2016, showing civilians fleeing Basra, Iraq, in March 2013. Photo: Paolo Pellegrin / Magnum Photos. 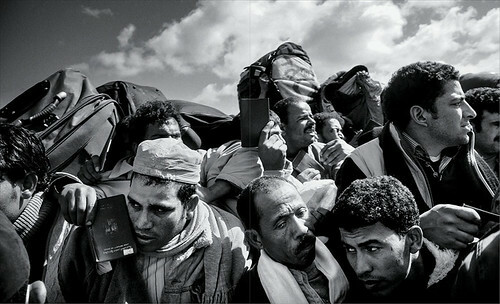 Refugees arriving from Libya at the border near Ben Gardane, Tunisia in March 2011. 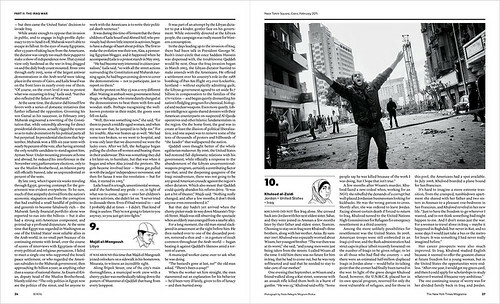 Map and portraits of the six characters featured in Anderson’s reportage. Illustration: Louise Zergaeng Pomeroy. 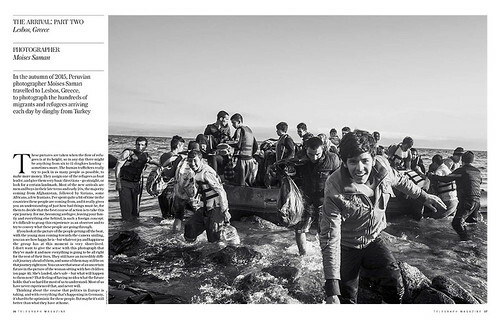 Spreads from The New York Times Magazine, 14 August 2016. Design Director: Gail Bichler. Art Director: Matt Willey. Editor: Jake Silverstein. 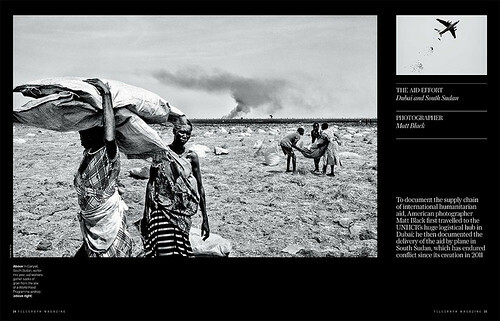 The ‘Fractured Lands’ issue is accompanied by a virtual reality film by video journalist Ben C. Solomon which can be viewed on the NYT VR app (no headset required). 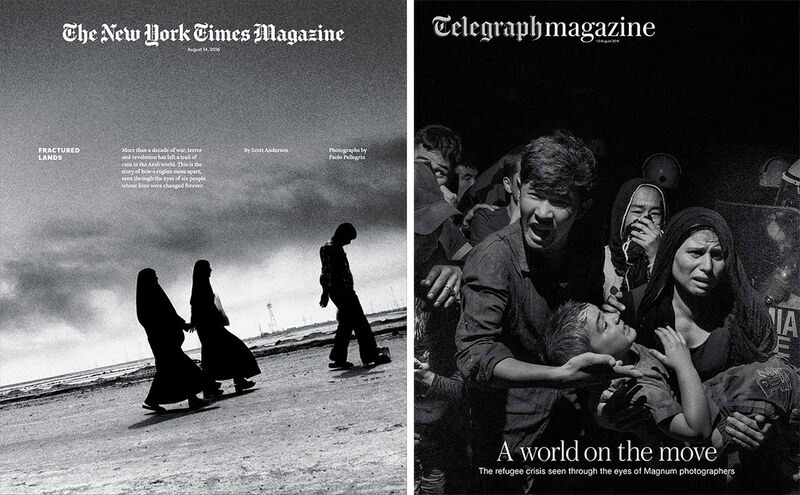 Meanwhile in the UK, this weekend’s Saturday Telegraph magazine has worked with the photo agency Magnum to make an issue that documents the European refugee crisis in pictures. Cover of Telegraph magazine, ‘A world on the move’, 13 August 2016. Creative Director: Jon Hill. Art director of this issue and special projects art director: Sara Martin. 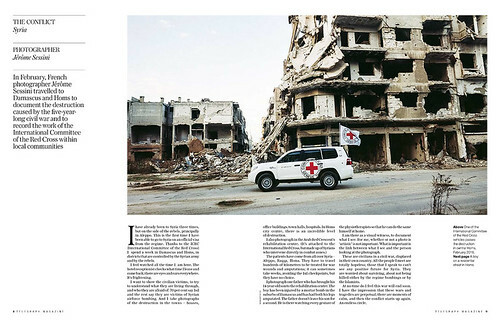 Spread showing a Red Cross vehicle in central Homs, Syria, in February 2016. Photo: Jérôme Sessini. Spread showing aid workers in South Sudan gathering sacks of grain at the World Food Programme airdrop site. Photo: Matt Black. Spread from Telegraph magazine, 13 August 2016. 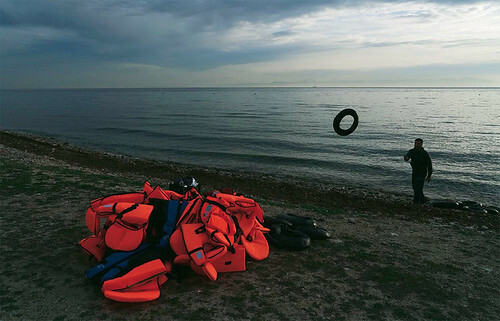 Spread showing migrants and refugees arriving at Lesbos, Greece, on dinghies from Turkey. 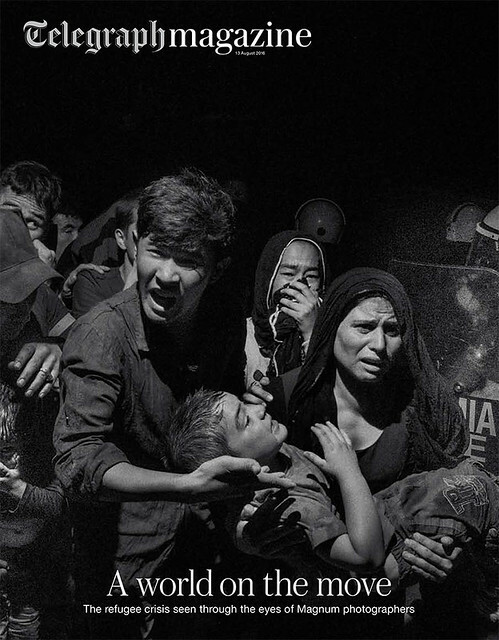 Photo: Moises Saman.